You'll love how durable it is! 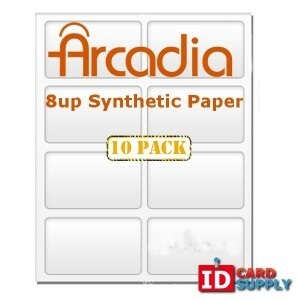 We sell Arcadia synthetic paper which is a brand of high quality paper that is perfectly suited to being used in ID cards. Read on to learn a little more about Arcadia paper, its uses and its benefits. Arcadia is the company that manufactures Artisyn and Teslin paper – both types of paper that are perfect for creating ID cards. But what makes this paper a good fit for an ID card over and above other types of paper? Why not just use the type of paper that you would if you were printing a letter? Well for starters, Artisyn and Teslin paper are both examples of synthetic paper. What this means, is that they are completely water resistant and the ink won't start running if they get wet in the rain or if they get temporarily dropped into a puddle. This is extremely important as it means your cards last longer and it means that you won't have your logo printed onto a dog-eared and water damaged ID card. Another advantage of using Arcadia paper is that it dries very quickly and keeps the ink on the surface. If you have ever printed onto soft or low quality paper, then you may have noticed that the ink can run and bleed out the edges. This results in the image looking blurry. With Arcadia paper however, the ink dries very quickly on contact with the surface and this results in an image that is crisp and high definition. Arcadia paper can be printed with a laser printer or with an inkjet printer. In the case of Artisyn paper, this will work well with both types of printer in any scenario. For Teslin though, you need to buy the correct grade of paper. More often though, you might find yourself using this paper with a printer intended specifically for creating ID cards, such as a Fargo printer. These have built in laminators which makes it quick and easy to apply a butterfly pouch to your ID cards. Taking an already high quality synthetic ID paper and then covering it in a laminated pouch results in an ID card that is cheap and easy to make but which has the same quality as any professionally printed PVC card. Another advantage of Arcadia paper is that it comes with punchouts. These make it easy to remove sheets of paper that are the size of ID cards with nicely rounded edges. These are the ideal size for fitting inside a wallet, though different measurements are available. Arcadia paper also comes in different thicknesses, depending on what you need it for. We highly recommend buying in bulk so that you can take advantage of significant savings. At the same time, bulk orders will allow you to make big savings and will ensure that you never run out of blank paper when you have new visitors arrive or when you have a new member of staff.